Bokkembap is Korean fried rice. It is rice cooked with gochujang, Korean red pepper paste, sesame oil & soy sauce & served with a fried egg. My favorite kind to get during my dinner break on a cold night in Korea was Kimchi bokkembap with kimchi cut up & fried in with the rice. For this recipe, I was inspired by the Italian fried rice balls, arancini. Arancini are dipped in eggs then breadcrumbs & deep fried. I decided to try this technique with kimchi bokkembap. Arancini are usually stuffed with ragu, mozzarella & peas. My bokkembap balls are not stuffed as the rice is already fried with several ingredients, including bacon. I chose to use bacon instead of SPAM. Neat fact: In Korea, you will often find SPAM in bokkembap. In fact, SPAM is extremely valuable in Korea & is used in various Korean dishes. It is a popular gift to give around holidays as a large box set & it costs an arm & a leg. The use of SPAM dates back to the war & the beginning of American military presence in the country. Every year around Chuseok, the Fall harvest holiday & Lunar New Year, I could expect to get a large box set with around a dozen cans of SPAM from my boss. Bacon is a perfectly acceptable substitute. In case you missed it, I’m posting 22 days of Korean Fusion. Check out my post from yesterday, Soy Sauce braised Deviled Eggs & check back in tomorrow for more fun fusion! Cook the bacon. In a bowl with the kimchi, use kitchen scissors to cut the bacon & kimchi into 1/2 inch pieces. Prepare the bokkembap. Heat 1 Tbsp oil in a pan over medium-high heat. Add garlic, kimchi & kimchi juice and cook for 1 minute. Add Soy sauce & gochujang and cook until the kimchi becomes soft, about 1 minute longer. Add the rice & mix everything well. Add the sesame oil & sprinkle sesame seeds on top. Let cool. Add 1 egg to the cooled bokkembap. In a small bowl, whisk the remaining 3 eggs together. Pour the breadcrumbs in another small bowl. Slightly wet the palms of your hands to prevent the rice from sticking, then scoop 2-3 tablespoons of bokkembap in the palm of one hand. Use the other hand to form the rice in a patty then roll into a ball the size of a golf ball. Dip the ball of rice in the egg, then roll it in the breadcrumbs. Set aside for frying. 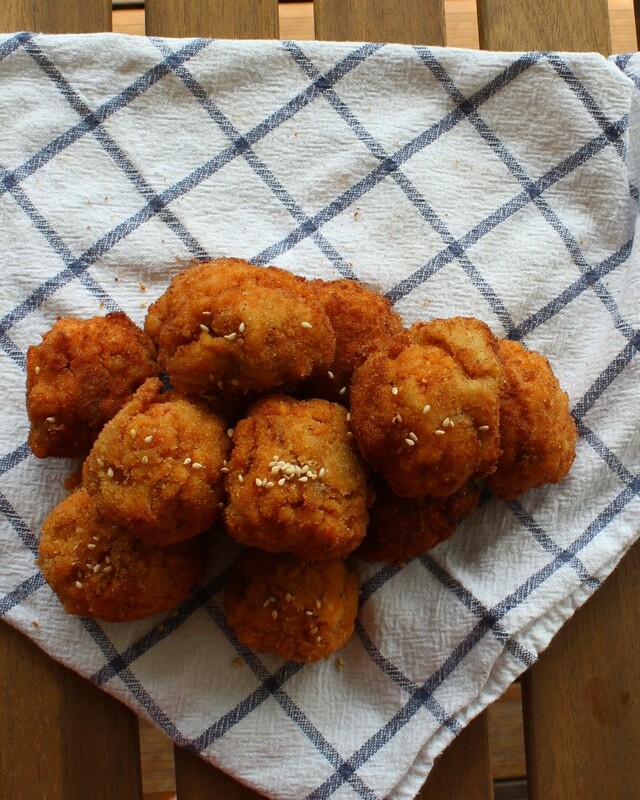 Once you have prepared the bokkembap balls, heat oil in a large pot for frying. The oil should be at least 4 inches deep so that they balls can deep fry. Fry them 2-3 at a time in the oil for 2-3 minutes on each side. They should brown on the outsides but not burn. Drain them on a plate lined with paper towels. *Glutinous short grain rice is extremely sticky rice. Calrose is a good substitute if you have trouble finding Korean rice. I hope you make some of these things for Thanksgiving dinner! These look delicious, btw!